It's difficult for me to describe Ann Arbor in one word, or even a few hundred of them. Ann Arbor is a college town, where I am pursuing a double degree and spending hours locked up in the library like the other 40,000 of us here. It's a cute midwestern city, vibrant with farmers' markets and a food culture like none other. But most importantly it has become the eclectic backdrop to where I have met my closest friends and formed unforgettable memories as I have taken on new adventures. I have come to meet so many new people and new faces -- especially as I try to capture what the typical male Michigan student wears. People often ask me where I find trendy males to photograph. They ask me questions like what part of Ann Arbor I frequent or what stores I might go to as if there is a specific geographic location where the males are automatically fashionable. But really, they're everywhere. Fashion-conscious college males make up a huge portion of the University of Michigan demographic, mixing their individual mantras with current trends to create outfits that emulate authentic style and are truly unique. However, there are most definitely a few articles of clothing that show up more than others, and they are staples to any person's wardrobe regardless of gender. For example, the pieces on this Fashionisto in particular are both as well made and fitted as they are practical -- making the garments timeless pieces that he will enjoy for years to come. 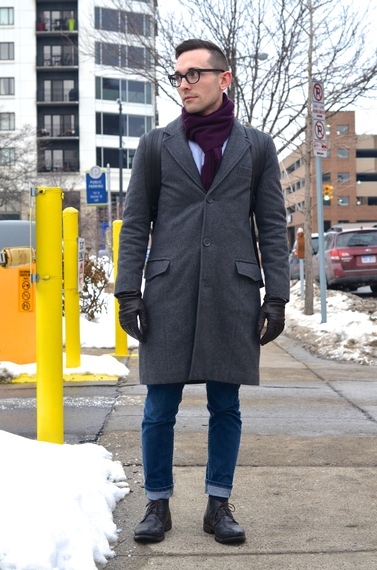 The commonality of fit and quality that unites the elements of this Fashionisto's outfit is nothing specific to just him though, as it is a trend that many Ann Arbor males embrace in their outfit choices. Gone are the days of sagging, XL T-shirts and a phobia of tight clothes. Indeed, most males embrace things that have little excess fabric and err on the side of less rather than more. This Fashionisto incorporates many well-fitted articles into his outfit. I strongly believe that everyone should have a pair of high quality dark wash jeans in whatever fit they like the most: skinny, slim, or boot cut. 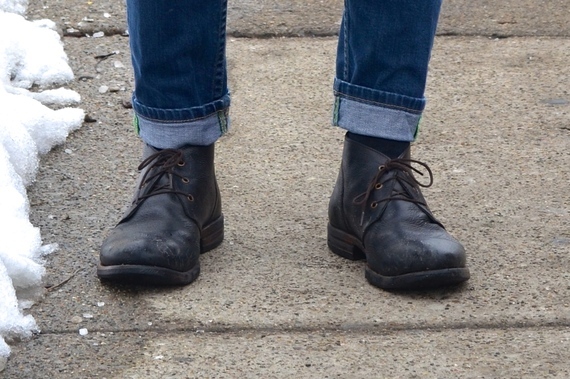 This Fashionisto rocks a pair of tapered jeans, cuffed at the ankle to accentuate his black boots. Tapered jeans are growing in popularity in menswear as more men are embracing boots and wanting to bring more attention to them, a task that neither skinny jeans nor boot cut jeans accomplish well. In addition, his gray coat is a classic color that's functional for both everyday wear and more formal occasions like interviews and recruitment events. It is extremely flattering for his body type and does not overwhelm his frame: The sleeves sit comfortably at his wrists, and his upper body is not swamped by bulky shoulder pads. Underneath his coat, he then provides some contrast by wearing a striped blue button down shirt. While the contrast is subtle, it is tastefully done and still noticeable enough to provide some variation against the gray. What makes this Fashionisto and other fashion conscious Ann Arbor males really stand out though are their unique accessories that add both edginess and dimension to their combinations. I enjoy how he embraces color in his outfit, confidently wearing a plum colored scarf rather than a neutral black or gray one. It adds a pop of color to his otherwise neutral outfit and is also quite practical for the weather. Moreover, as a fellow "four-eyed" comrade, I love his glasses. They accentuate his facial features, bring out his eye color, and give off a sense of intellectual curiosity -- something that truly distinguishes and unites all Michigan students in our welcoming academic community. Jiaxin Zheng is a sophomore studying business and informatics at the University of Michigan. She is a member of the Michigan Ballroom Dance team, and also teaches Zumba classes. In addition to CollegeFashionista, she does a lot of photography in her everyday life and showcases everyday delights on her blog The Machine (jiaxinmachine.wordpress.com). She hopes to someday work for a fashion-related startup and have many puppies in her presence.